I stumbled on The Scarlet Hotel a couple of years ago whilst staying in a local caravan! 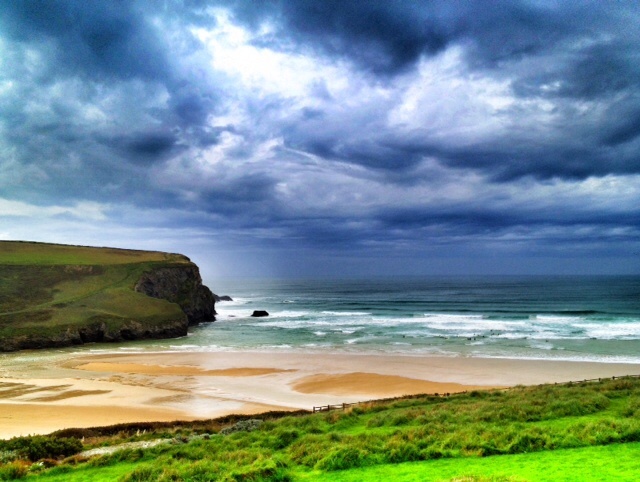 I noticed it up on the hill whilst on the beach at Mawgan Porth in North Cornwall. Intrigued I ventured up, and despite the flame being slightly embarrassed at the intrusion I sampled the special views and atmosphere that this hotel exudes. I vowed there and then that I will be back, and so it came to pass. Having slavishly endured a fabulous twenty four years of marriage to the flame we set about some sort of celebration. The Scarlet Hotel provided the celebration with aplomb. The estate agents harp on about ‘location, location’. Would The Scarlet Hotel be just as enchanting based on a roundabout just outside Slough? Probably not. 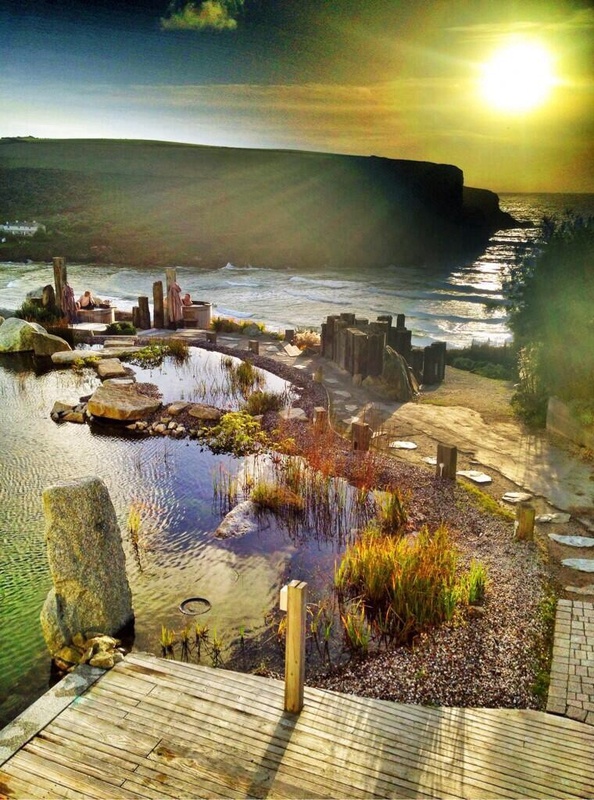 There is no doubt the fact that this hotel is huned into the rock of a Cornish hillside overlooking a wild, sea lashed stretch of golden sand clearly gives the hotel an edge. The views from any room are totally captivating. The views change almost by the minute. Particularly on a wild October day with the clouds rolling in from the west and the sun moving slowly round the corner. You notice things are different as soon as you arrive. A lithesome, broad shouldered surfing dude or ‘dudess’, ghosts from the side to invite you in. Whilst looking for the reception counter you realise that there isn’t one, and as you are being shown round the hotel by a suitably tanned hostess you then further realise that all your needs as being noted and settled. By the time you get to the room you notice you’re luggage is already in situ. The only complaint was that my best shirt wasn’t unpacked and hung up! 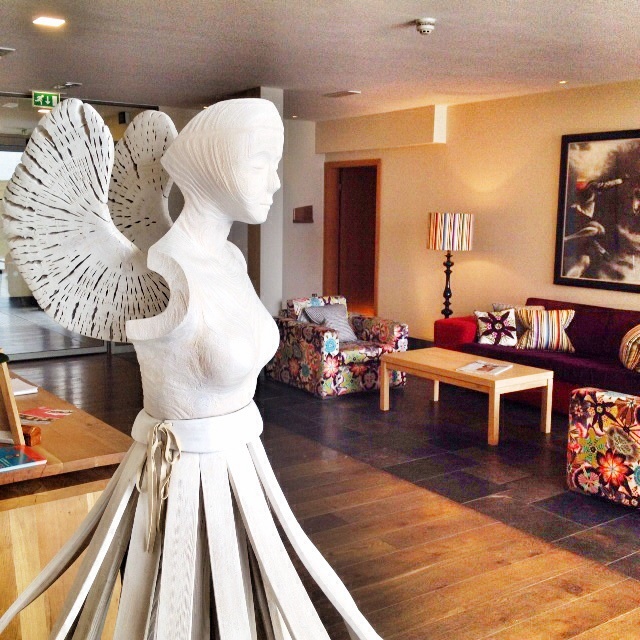 Apart from the luxury, the views, the food, the spa, the outdoor hot tubs, the pools, the location, the architecture, the wonderful furniture, the artwork by local artists, the hotel boasts it’s Eco credentials. I’m not a lover of the term ‘ecofriendly’ feeling it is rather over used, but the effort The Scarlet goes to is impressive. Not just a warning about how much detergent it takes to wash your towel like most hotels, it then uses recycled water, biomass boilers, no air con, self purifying pools, organic soaps, and these are just a few of the extraordinary measures the hotel undertakes to avoid waste. As this is a foodie blog I suppose I should get on about that! Sadly my camera failed me in my hour of need and so I have had to use a few library shots. 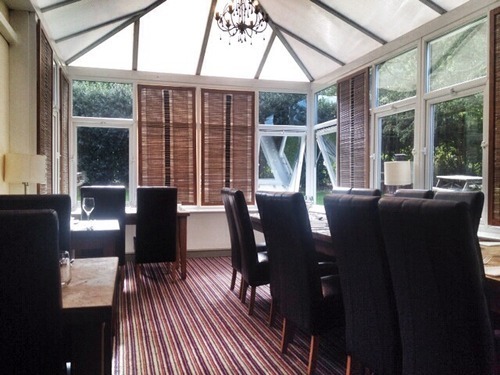 The hotel boasts an ever changing menu using local produce. The flame and I managed to wolf a good deal of mackerel, monkfish and ‘Bre Pen’ lamb. The food is beautifully presented as you would expect. Flavoursome and cooked well. I hesitate to suggest however that at £42.50 for three courses casual visitors might find the whole event a little underwhelming for the money. For us this was all included in our three day spa break. The dining area at night was a little disappointing if I’m honest. Given it was dark, and that there was no view and our table was facing the window, I felt there was a lack of atmosphere. The room was very quiet and dark. 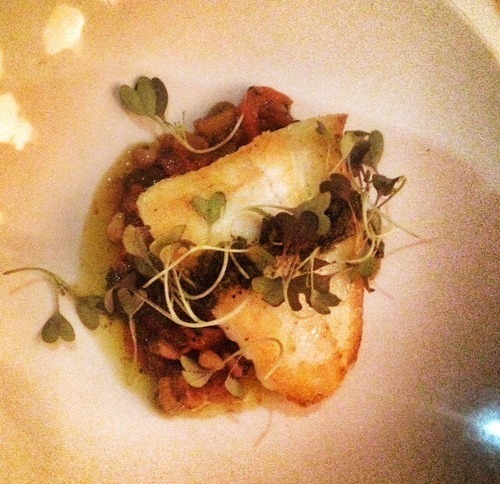 A stark contrast to a meal we had at Fifteen Cornwall down the road. That said the same table was transformed in the morning for breakfast into arguably the finest view you can possibly have anywhere. 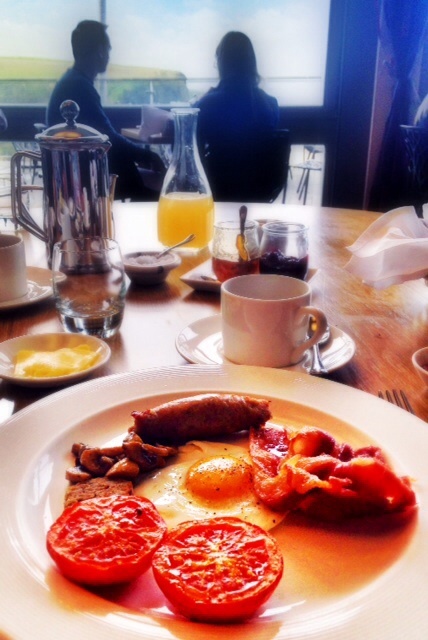 The breakfast in particular was spectacular anyway. Again using local produce the homemade granola, Cornish yoghurt, Cornish sausages, bacon, eggs all cooked and taken formally as part of a three course, served at your table meal. The breakfasts were a major highlight of the weekend for me. In all the whole experience of spending three nights at The Scarlet Hotel was a truly memorable one. 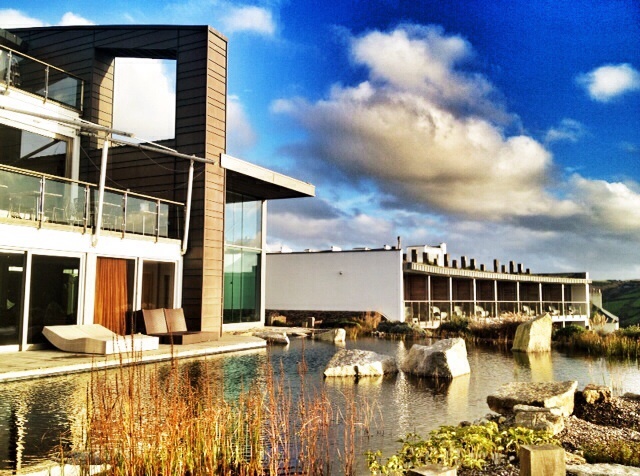 It was without doubt the best hotel we have stayed at, certainly in the UK. 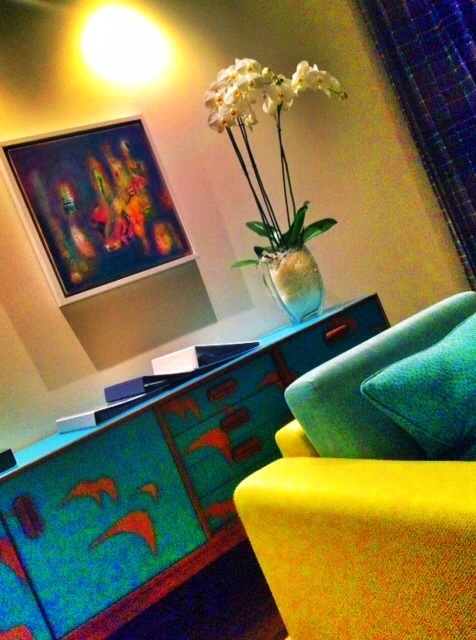 It is easy to see why the Sunday Times named it their No 1 hotel in their top 100 places to stay. To most the cost of staying here means that this is the sort of place you stay at for a special occasion. I can’t imagine how it would falter in providing a suitable backdrop to savour that time. 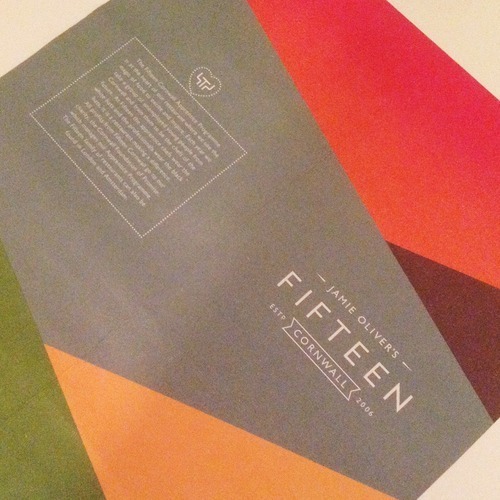 Fifteen Cornwall is the second ‘Fifteen’ restaurant, the first was set up in London by Jamie Oliver and started a pretty smart idea to train often troubled youngsters how to work in a kitchen and hopefully become professional chefs. It has been a great success. 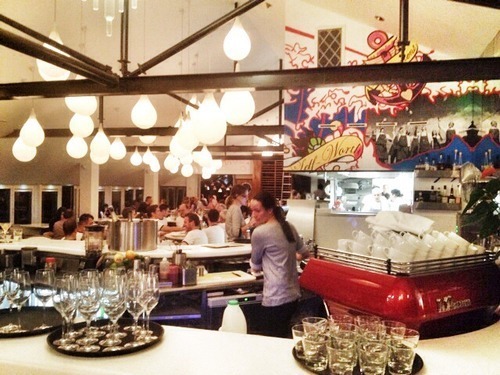 Many of the trainees have gone on to work and run their own restaurant or work in Fifteen. 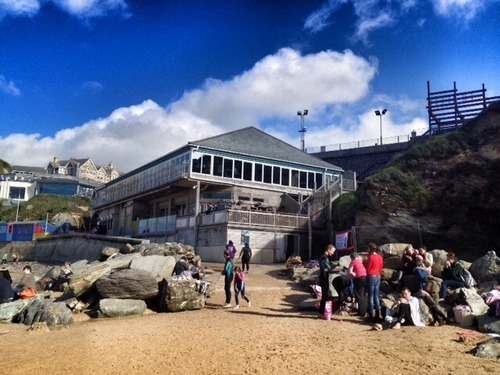 The one in Cornwall kicked off in earnest in 2006, it’s housed in what is basically a big surfing hut, spectacularly overhanging the beach at Watergate Bay near Newquay. Miles of golden sand sprawls beneath, whilst surf height waves crash in the distance. Whilst it is a big hut on the outside, it has been transformed inside into a 120 cover, high end, Italian restaurant. Unlike many High Street versions, you cant nip in here for a take away ham and pineapple pizza. 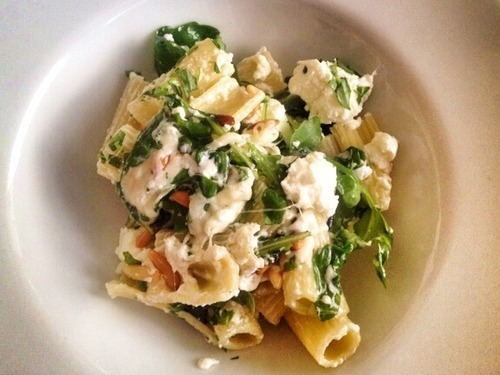 Whilst many ingredients are sourced from Italy, the restaurant does use lots of local produce as well. The room is dominated by dozens of teardrop pendant lights and an open pass decorated by a gaudy/tasteful*, hip/uncool* mural (delete as applicable). The mural features imagery of Jamie Oliver and the recruits alongside managerial speak slogans. It seemed to create a talking point among many, so that can’t be a bad thing. The flame and I ventured down there for a special weekend break (get you – Ed), we booked for the Saturday evening. We were placed onto a table that would ordinarily look out to sea, however, given it was late October and 8pm at night we gazed into a black abyss. We have been before a couple of years ago for breakfast and sat on the same table with the patio windows open, gazing out to a sun kissed waterline. Then it was arguably the best table anywhere. It was slightly less so tonight. The restaurant was absolutely rammed, the atmosphere electric, buzzing with the chatter and clatter of hungry punters and teams of staff keeping it all in check. We were served throughout by the wonderful Clare Louise, who helped us through the trendy, five course taster menu (£60 each) with clarity, passion and a big smile. It looked like everyone was getting the same treatment. By opting for the taster menu I was aware that the courses would be smaller. Having watched head chef Andy Appleton cook a huge, longhorn, ribeye steak at a demo earlier in the day I was tempted to go for that, but just about resisted. 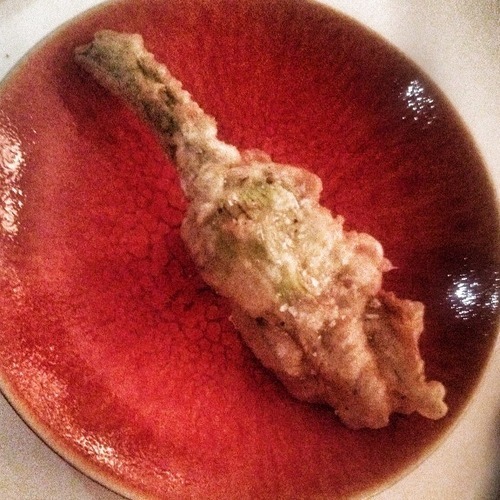 After bread, olives and dips our Antipasto course was a stuffed, deep fried courgette flower. The flame grew some of these this summer so I’ve done these myself. This was as good as mine (you’re showing off – Ed). Piping hot ricotta, deep fried within the flower in a light batter. Next we had our ‘Insalata’ course, the flame had a buffalo mozzarella salad with heritage tomatoes, whilst I hoovered up a delicate lobster tail salad with the trimmings. It was all becoming rather agreeable. We sampled a couple of decent wines along the way. Primi course, I had a sensational pulled lamb ragout with fancy pasta strips. 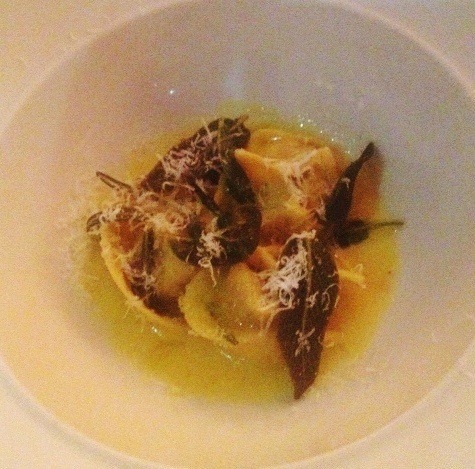 This course in particular was sublime. The ragout rich and flavoursome, the lamb stranded in a deep, luscious sauce. Across the table sweet potato tortellini was being washed down with roasted peppers and an appropriate jus. Secondi I had slithers of soft, pink duck breast on a base of soft polenta whilst the flame had a beautifully cooked fillet of brill layered on a pepperonata. 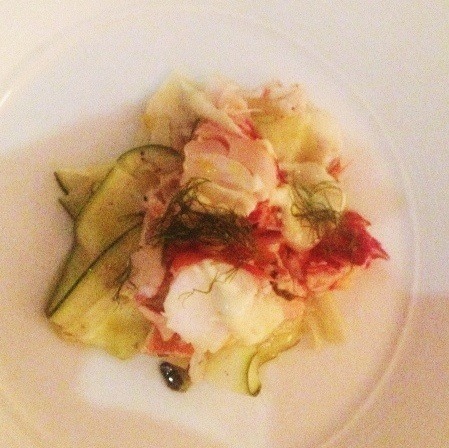 This arguably the dish of the night. The flame granted half a fork full for me to taste. 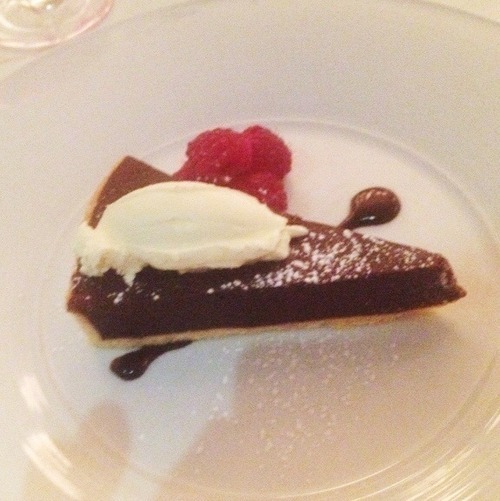 For our Dolci I had a seriously chocolatey, chocolate tart with raspberry washed down with a snifter of Sauternes. The flame tucked into the cheese board with a coffee and petit fours. It was a memorable occasion and will remain one of our favourite haunts. The heady combination of location, atmosphere, drama and sheer quality of food and service make Fifteen Cornwall a trick not to be missed. If you are down this neck of the woods you will discover that you are only ten miles down the coast from Padstow and Rock, home of some of the Rick Stein and Nathan Outlaw outlets. I have tried these on a previous trip and would easily put a night at Fifteen Cornwall up against these. None can match Fifteen for the atmosphere and view. As Michael Winner once said “I don’t reserve a restaurant I reserve a table”. 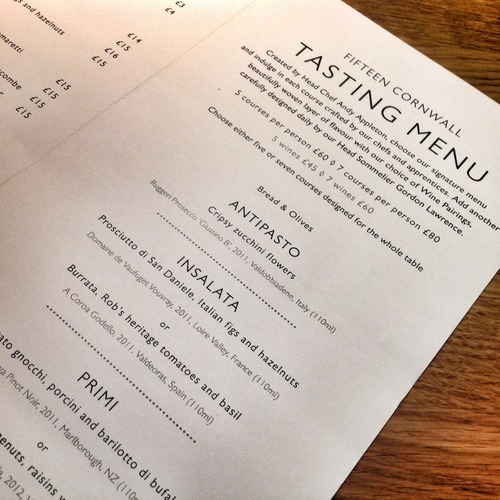 There’s some very nice tables at Fifteen Cornwall. 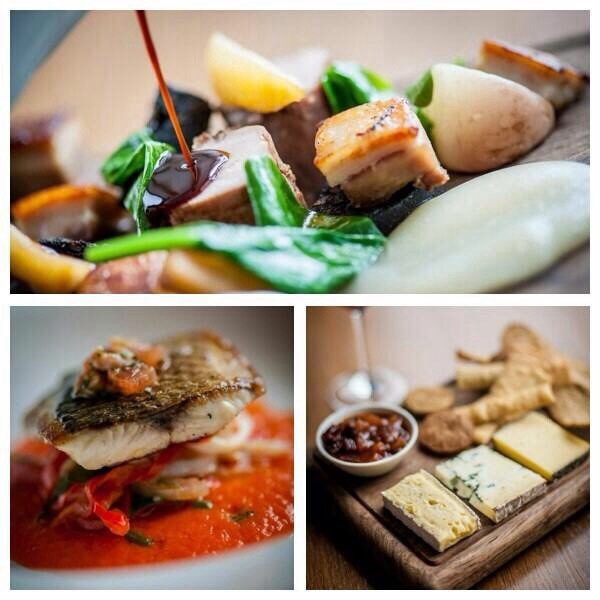 I know most Foodies are clamouring to get stuck into Aiden Byrne’s new Manchester Resteraunt ‘Manchester House’. Whilst I’m hearing great things it does appear that you need either a special wallet or know someone that likes you very much to take you there. I will get there one day, but in the meantime you can do no worse that get down to Aiden’s rather more humble abode ‘The Church Green’. It is beautifully positioned, close to the pretty Cheshire village of Lymm and even closer to the equally beautiful Lymm dam. It’s become a bit of a staple, fall back place to eat for the flame and I. Whenever, we wonder where to go, more often than not, The Church Green pops into our thoughts. It’s a twelve mile scoot for us. We’ve been several times for lunch and a couple of times for a Sunday breakfast. It’s always been excellent. 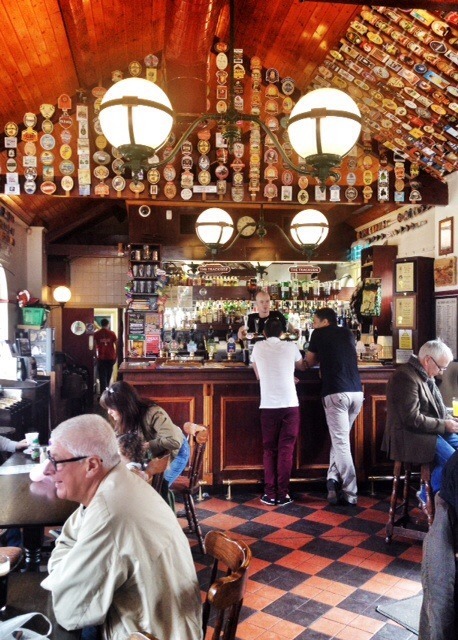 A bit pricier than your average pub, but it is quality. Following a chance tweet to ‘come and join us for lunch’, we took them up on the offer and ventured down the M6 for another taster. 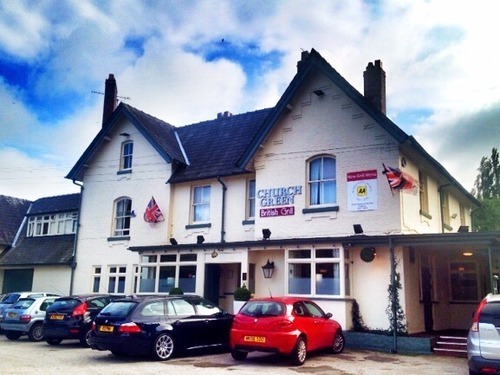 The fare here is classic British, using local produce where possible. As ever, we enjoyed a warm welcome and was shown to our table in the conservatory. There was no one else in at the time but it quickly filled up. 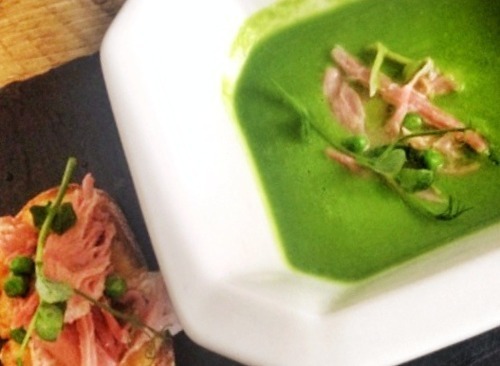 The flame won the starters, a wonderful pea and ham soup (£7.00) with some more ham hock on a warm Welsh rarebit. It tasted fresh and velvety. A great start. I ventured into slightly unknown territory for me, Goats Curd and Rigatoni (£7.00), pleasant enough and you got a fair portion, something The Church Green never shy away from, portions are rarely an issue here. 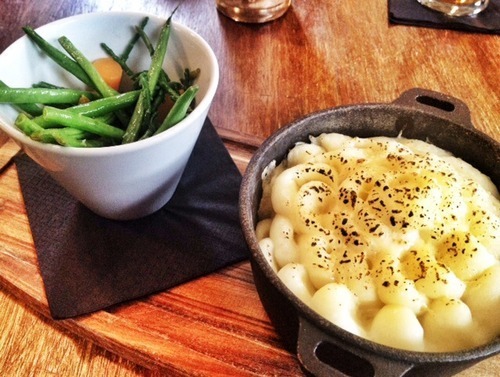 Take the flame’s next course, fish pie (£13.00). 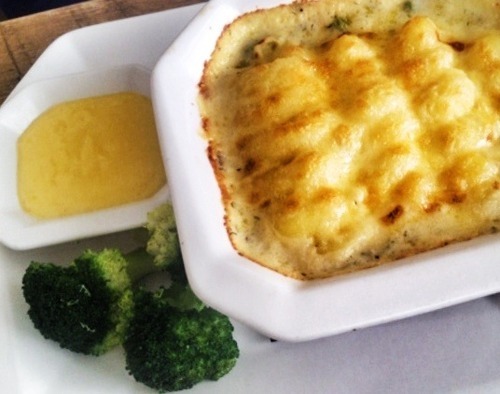 You get a whopping dish of creamy mash, layered with tons of fish, oh and you get an egg in there as well! A cracking dish. I went a bit safe, 5 oz burger (£8.00) but with a smoked, pulled pork topping (extra £4.50), crikey it was good, I could have had a 10 oz, but I think I chose right. The accompanying hand cut chips were fantastic, hot, salty and soft. The flame couldn’t keep her hands off them, so they must have been good! I once again had a dessert for research purposes. 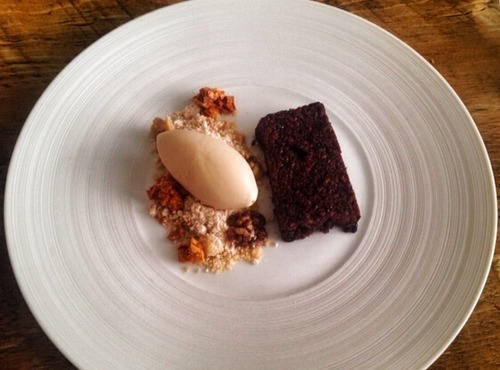 Treacle tart with candied walnut and salted caramel ice cream. A lovely sticky end, though a bit pricey at £7.80. All in all the bill came to £52 for two. I dare say you could nip round to your local and spend £30, but would every bit of it be as good as this? I doubt it. Never has the old adage you get what you pay for been more appropriate. Once the coffee had settled you cant beat a quick circuit of the dam hand in hand with your beloved (or even the wife!). It’s even worth a nip into the village, there’s a cracking deli (Sextons) and a top butcher (Hopkinson’s) in there if you need to stock up on some goodies. Somehow The Flame had bagged herself a week with the girls in Tenerife. This left yours truly all alone, cast adrift like a ‘Pop Idol’ winner. What should I do? The Cook Twit is a resourceful soul, off I went, armed with an iPhone and a natty man bag! The weather and public transport was kind and within the hour I found myself teleported into the gritty market town of Bury, home of the black pudding and the original Katsouris delicatessen. I grabbed a brace of said puddings (after several tasters) from Chadwick’s. 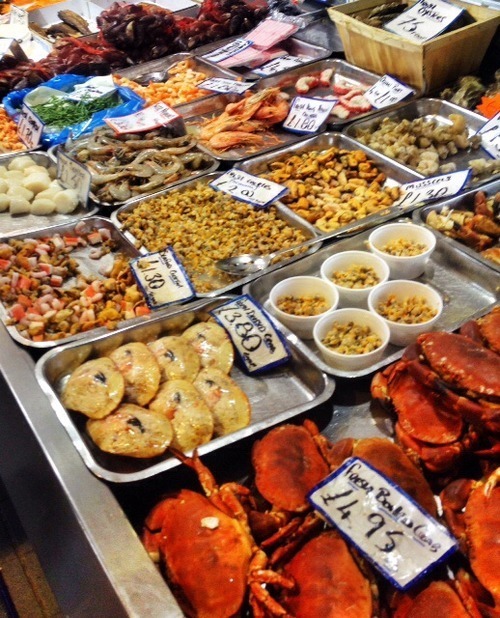 My only gripe was not being able to stock up on the cracking seafood and fish on offer in the rather splendid food hall. Next up a steam train ride up the Irwell Valley to Ramsbottom. Not before a well earned restorative at the The Trackside Pub on Bury Station. A light, pint of ‘Piston Broke’ oiled the pipes. 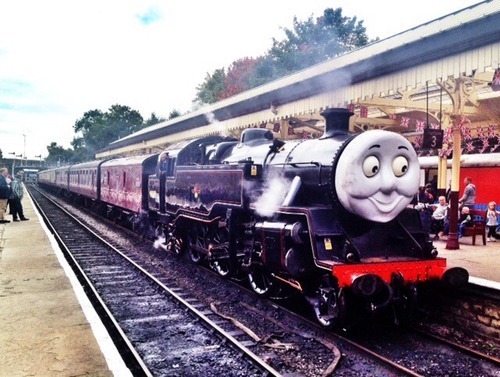 As luck would have it The East Lancashire Railway was having a Thomas the Tank Engine weekend! This meant my short weave up the line was shared by several thousand screaming little people all painted up as lions! Still, my ultimate quest was in sight. 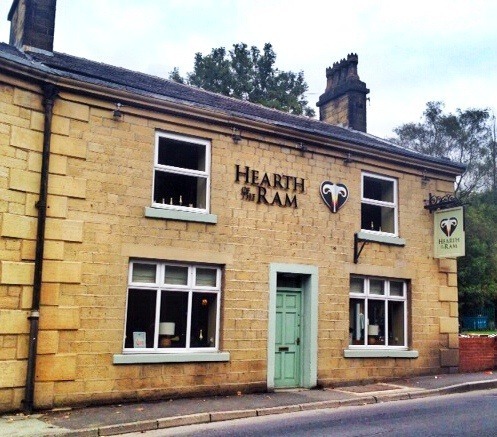 A short skip right from the station in Ramsbottom found me worshipping at the altar, hitherto known as the ‘Hearth of the Ram’. First impressions leading up were somewhat tainted as the former pub is adjoined to a highly branded dental surgery, still I managed to get a decent shot showing that the Ram itself also sports a modern logo which traces through the menus and website. I thought it looked quite smart and gave the impression that this was a serious set up looking to trade with up to date techniques whilst revitalising and maintaining a building from the past. 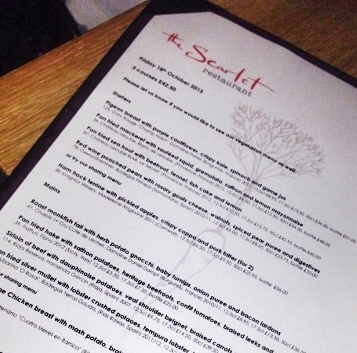 A veritable, phalanx of friendly and attentive staff sat me down and presented the rather smart menus. Oh yes and a pint of Timothy Taylor! One menu was entitled ‘Simple Things Done Well’, the other was the ‘a la carte’. As this was a Saturday afternoon I thought I’d give the a la carte a side swipe until another time. It did look good though, how about ‘poached smoked haddock, truffle cream, soft poached duck egg and black truffle’ to start (£8.95), or as a main ‘seared Goosnargh duck breast, potato fondant, beet root gel, kale with a ginger and orange sauce’ for £18.95? I surveyed the decor whilst I waited for the first course. It seemed a little sparse if I’m honest, perhaps Euan and Dena are waiting to for a few more nick knacks from the past to build it up? 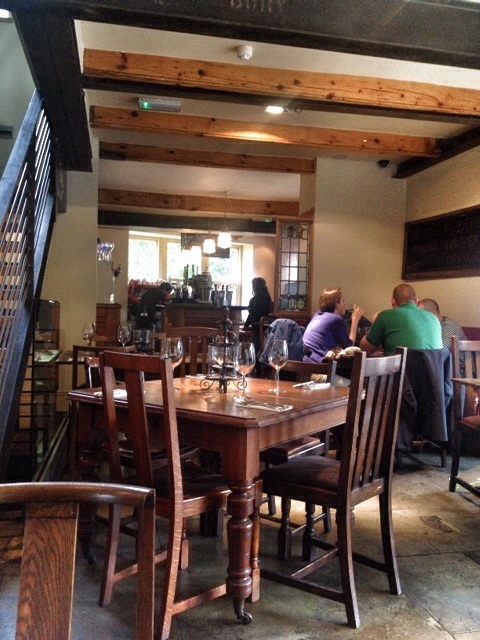 But hey minor quibble, the wooden tables, stone floor, red leather banquettes made for a charming space. The room is dominated from my eye by the steely stairway which spirals it’s way from down below to way up high. Maybe in its industrial past it housed some sort of winch to haul wrought iron from the Irwell? Anyway to the food! 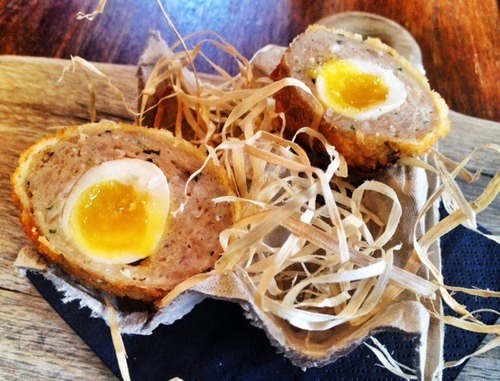 From the ‘Simple’ menu I started with Quail, Scotch Egg (£1.95). Heathens might suggest this was presented in an egg carton with some straw on a plank, but I would beg to differ. It was delivered on a batten of driftwood, nestling in a pocket of the softest raffia. I thought it was a delight. The egg itself was encased in soft, moist, peppery goodness. I ate it with my hands, it was gorgeous. Next I plumbed in from the sea, I went for the Hearty Fish Pie (£8.95). Piped in its own ceramic cauldron, armed with a separate cup of samphire, green beans and buttery carrots, it once again kept well up with expectation. 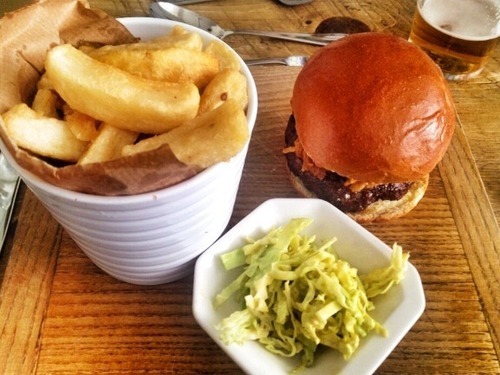 I could have chosen from other pub favourites such as the 28 day aged beef burger, or the steak and ale pie. I then thought I would test the chef out. 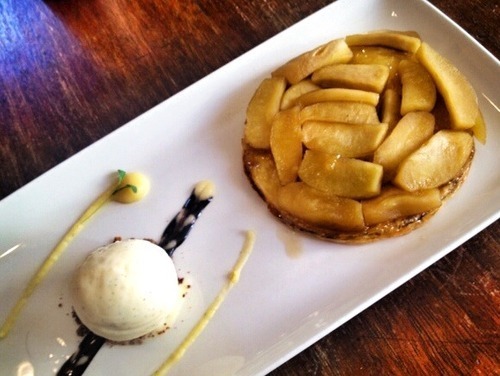 I had an awful Apple Tarte Tatin a few weeks back, but the ‘Hearth of the Ram’ turned up trumps this time. Theirs was just as the doctor ordered, ‘caramelly’ (is that a word? Ed), buttery and sweet (£5.95). I’m even sure there was some coriander in the garnish which added a twist. I wolfed it with a sweet wine. I ventured out somewhat woozy from the wine and missed the train back to Bury. I managed to thumb a bus and was soon back in Manchester before heading off into the sticks. I had a thoroughly enjoyable day (even Utd won!) 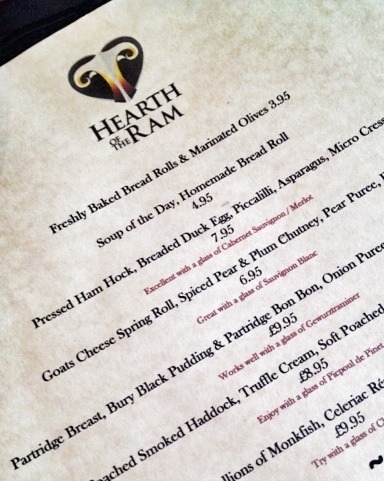 and can honestly say the ‘Hearth of the Ram’ is definitely a place I will go back to. I might even take ‘the flame’!